Most of you know that Kari and I and her two brothers' families built homes next door to each other in 2004 (we affectionately call it the COMPOUND). 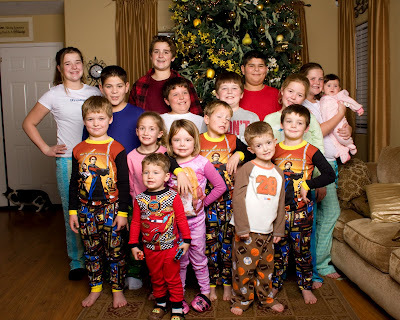 For the last five years, we have taken pictures with all of the cousins on Christmas Eve in their new PJs. Here is our latest pic, taken in our living room (we rotate houses each year). This will definitely be fun for the memory books! Also...note Zach's robe...he has worn the same robe for the last 4 years. We know what he's getting next year for Christmas! It's fun to see the cousins added over the years and it's hard to believe that in 5 years, we'll be sending Zach out on a mission. 2007...In Grandpa and Grandma's house...They moved in next door to us in 2007 (making it 4 houses in a row). 2004-Our first year in the compound! Taken at our house. my goodness! when did those kids grow up?! and there are so many of them. sheesh! i love watching the progression of the photo quality too - it gets better every year! boy that last one looks like studio quality for some reason... i want to know if you photoshopped the cat into the picture or if it just happened to walk by at just the right moment. The cat was there...I was going to cut him out...but I decided that he was part of the story too!